For this tutorial, we will be using Game Maker, a very powerful game engine that makes it possible to create games (essentially 2D) using drag and drop features. This software requires no programming skills, although you may, if you wish, use a built-in scripting language (GML) to harness more advanced features. Download the assets to create your game here. To create a moving character, we need to create an object; this object will be using a sprite that will define its appearance, and the object will then be added to a room, which is where the game takes place. In the section labelled Name, type “pac_man_left_spr”: it is often useful to give unique names to your resources, and a good practice to add _spr to sprites’ names and _obj to objects’s names. Click on the button labelled Load Sprite. In the new window labelled Open Existing File, click on the folder where you have saved the sprites downloaded previously, and display its content (e.g., Desktop). Open the folder labelled pacman, that you have created previously (from the zip file that was downloaded). Select the image labelled pacman_left, and click on the button labelled Open. This should display a preview of the animated image on the right-hand side of the sprite window in Game Maker. At this stage, you should have five different sprites ready to be used for your character as illustrated on the next Figure. Note that , so far we have created sprites using the menu Resources so far. However, we can also use the corresponding shortcut located on the tool bar. We will now create a corresponding object. An object is a container that you can move around the room and which appearance is defined by a sprite. As we will see later, the appearance of your object can change overtime, based, for example, on its movement (e.g., animated character). A new window should appear. In the section labelled Sprite, click on the text <no sprite> and select pac_man_stand_spr from the list. Click on the button labelled OK.
At the top of the window, enter the number 32 in both fields labelled SnapX and SnapY: this is because the sprites that we will be using in this room have a size of 32 by 32 pixels; so that they “snap” perfectly to the room tiles, we arrange the room accordingly. In the section labelled Name, enter the text Level1. We, could, however, call this room any other name. In the new tab, click on the empty field below the label “Object to add with the left mouse” and select the object pac_man_obj, that you have created previously. As you can see, this object is already displayed by default. As we will see later, the last object created in your project will usually appear first in this list. So far we have added Pac-Man to the first level; however, we need to control our character so that it can navigate through the level. Double click on the “pac_man_obj” object, this should open a window with the properties of this object. In the new window, click on the button Key Press, then on the button <Right>. This should add the event “Press <Right>” to the event window. At this stage, we need to associate an action to the event that we have defined. In other words, we need to tell GameMaker what should happen in the “event” that the user presses the right arrow key. What we would like, in this situation, is for Pac-Man to start moving to the right and we will select the corresponding action in Game-Maker. You will notice a selection of tabs to the right of the action window, one of them is labelled “Move” and contains actions related to characters’ movements. In the new window, click on the right arrow and set the speed to 2. Repeat steps 2 to 9 to create movement to the left, up, and down. Test your game (Run > Run Normally). You should see Pac-Man moving in all four directions as you press the left, right, up, and down arrows. Double click on the pac_man_obj object, this should open a window with the properties of this object. In the new window, click on the button Release <Any Key>. This events correspond to any key being released. So in our case, if any of right, left, up or down keys are released, this event will be triggered. From the “Move” section of the window, drag the top left icon (red star; same a previously) and drop it in the “Action” section; this should open a window called “Move fixed”. In the new window, click on the middle square and set the speed to 0. Close the window for this object and test your room again. You should now notice that Pac-Man stops whenever a key is released. 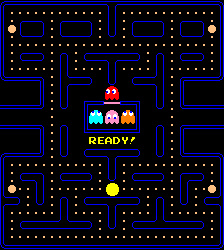 At this stage, Pac-Man can navigate in all four directions and stop when a key has been released; however we could improve the appearance of the game by changing the sprite representing Pac-Man depending on its direction. Double click on the pac_man_obj object (left-hand window). Select the event Press <Right>. Click on the tab called Main1 and drag and drop the icon Change Sprite the action window, as illustrated on the next figure. Event Press <Left>: sprite labelled pac_man_left_spr . Event Press <Up>: sprite labelled pac_man_up_spr. Event Press <Down>: sprite labelled pac_man_down_spr. Event Release <Any>: sprite labelled pac_man_stand. Solve all your Linear Algebra Headaches and Get to Understand How it Works with Unity. hi, i installed gamemaker studio, the free version(version 1.4.1657) but there is no such thing as resources, create room. Dpo you know what happened? Also, is it possible to replace the dots pacman is eating(not all of them) by letters?